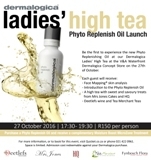 The launch of the Dermalogica Phyto Replenish Oil is set to take place at each of the Dermalogica Concept Stores throughout Cape Town this October. As part of Dermalogica’s exciting new series of interactive concept events October is set to host three fabulous late afternoon high teas at Cavendish Square on Tuesday the 25th October, 26 October at Wembley Square and 27 October at the V&A Waterfront. Each of the events kick off at 5:30 pm and will wrap up at 7:30 pm. Phyto Replenish Oil is a luminous, hydrating treatment. This feather-light treatment oil rapidly absorbs to reinforce the skin’s protective barrier. Wear it alone or layered under foundation for all-day dewy skin. Upon the purchase of the Pyhto Replenish Oil guests will receive a complimentary moisture boost MicroZone treatment to enjoy at their leisure. Guests will enjoy a delicious spread of canapes and confectionary catering by HQ restaurant and Mrs. Jones Cakes, complimented beautifully by Deetlefs multi-award winning wines and Tea Merchants refreshing teas. For the special occasion Fynbosch Flora will be elegantly decorating each of the spaces, uniquely transforming them with beautifying touches. Tickets are R150 each, redeemable against the purchase of any Dermalogica product, and are available via Quicket [https://www.quicket.co.za/organisers/4450-dermalogica/] Seating is limited. Payment in advance is essential.